without doubt, one of the strongest mixes in the mnml ssgs mx series to date was #11 care of silent servant, who delivered a serious set of straight up, no nonsense techno. it has been one of the best received mixes we've had and rightly so. and just to prove it wasn't a fluke, he has done it again for us... 'la segunda' is quite simply techno at its very, very best: raw, powerful, dynamic, rhythms for your mind and body. for me, this sums up silent servant perfectly: raw, powerful, genuine. techno. no need to say much more about the mix, it speaks for itself. as usual, tracklist to follow. next week the mission continues with giorgio gigli. until then, enjoy some red hot techno care of silent servant. Yes, yes, YES! I woke up with a particularly acute case of the 'Mondays' today. This mix made me completely forget about the doldrums of my ho-hum existence. In fact, it reminded me, once again, that techno is the one unbreakable bastion in my life. Wow. SS and ssgs just totally made my week! Thanks as always! What is the track after "Sleeparchive - Elephant Island" ? Thanks. man that track at around 4 minutes is insane. great listen. been hammering this mix away over and over and over for about a week now. by far, the best mix I heard in a "LONG" minute! Absolutely brilliant set. Thank you for this. fabulous. cannot wait for his new singles; just got 'the blood of our king' after procrastinating for too long and it blew me away. great mix. thanks ssgs and silent servant! is that some weird version / mix of "the sound" by reese + santonio i heard in there? an excellent display of let the talent/music do the talking. woah. corking. the bass around 30 mins - oomf. as i said guys, you'll get the full tracklist in a few days. so why not just stop worrying about IDs and enjoy the mix for the time being? Thanks for ruining it...i haven't heard the mix yet. There's a reason why the ssgs aren't posting tracklists. sorry about that - should have been moderating the comments more closely. dont worry 8 digit - still plenty of surprises. the tracklisting will be released on the weekend. until then i'll be deleting attempts to try to construct a tracklist. i really do not understand why some people get so caught up with ID'ing every single track. when you go out to a club do you expect/need/demand to know every track? enjoy the mix for now and any record hunting you want to do you can do next week. Powerful, dynamic and funky as hell. Entertainment in an age of snoozefests. Nice one SS and SSGS. 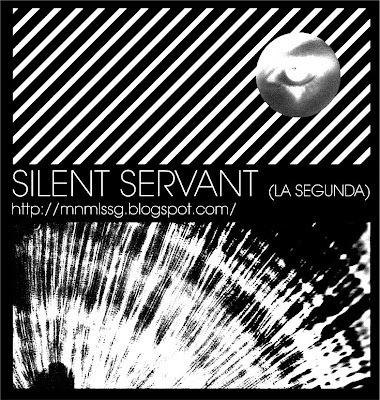 Haven't heard the first Silent Servant mix but will certainly give it a go after this. @ jonnyp: nothing to apologise for. it is worth debating this stuff. this is i think only the 2nd or 3rd post i have deleted. ever. and i probably didn't need to. but this constant need for instant gratification with tracklists frustrates me no end and i over-reacted, so my bad. with posting over at RA, the main purpose of that is to get more exposure for the artist in question rather than mnml ssgs per se (but obviously we like that too). we have a certain way of doing things which isn't going to appeal to many. so i am not sure how much bigger our readership can get. but what is really important for me is that fantastic mixes like this get heard by as many people as possible. so, apologies for over-reacting + fair enough pulling me up on it. but we will be keeping with our policy of mixes first, tracklistings later on. open ears. @chris (and others): I'm not trying to fulfill this need for instant gratification...I'm merely trying to be helpful. However, if you wish for it to be kept secret, I shan't go forth. Let's just say it's curiosity as opposed to being a show off. Mixwise, I really do like this mix. A good mix of Berghain sound, influences of Chicago, and proper dub grooves. Something for the weekend, indeed. Jason, that's all well and good, however you seem to have painted yourself into a corner on RA as 'the tracklisting monster' and believe you are providing some kind of service to the community. All it ends up doing (from my perspective) is deconstructing something that doesn't need to be deconstructed. Particularly when the whole is better than the sum of its parts. Taking an engineering approach to a creative output just doesn't gel in my books. Please don't take this as a personal attack as I have zero doubt that you are a huge and devoted fan of electronic music, accept it more as an observation from someone who is regularly exposed to the somewhat excessive devotion to the tracklist. Well, this is trainspotting in its purest form, is it not? ...but/and as far as we SSGs are concerned, we've had a consistent and clearly expressed stance on this since January. It's been kind of a New Years' Resolution for us. Regardless of your own desire to know the tracklist, all we want is for people in our space (which is, also, your space) to respect that.... it's not like we *never* post the tracklistings, in any case. ...my Night Light mix is the exception. I'll get there at some point. This mix does not work very well. Good tunes, but a little directionless. Has some really nice moments, but fails to carry them through. Not a patch on the first SS mix. "This mix does not work very well. Good tunes, but a little directionless."